Since this is primarily a FOOD and Travel Blog, just couldn’t leave off some dining advice for Sedona. First, do stop in to have breakfast or lunch at Miley’s Cafe on Hwy 179 about 6.5 miles from downtown Sedona. Best Huevos Rancheros north of Jalisco and service so fast and efficient you’ll be amazed. Second, don’t miss Cafe Elote also on Hwy 179, but much closer to downtown. This was my second visit to Elote, I actually ate there 7 years ago and it was every bit as good as the first time! Look past the rather funky entrance, (steel steps and ramps up to the front door) and get ready for elevated southwest/Mexican cuisine and drinks. This place is perpetually busy and only open from 5-9pm daily- so expect a wait. Your patience will be rewarded. 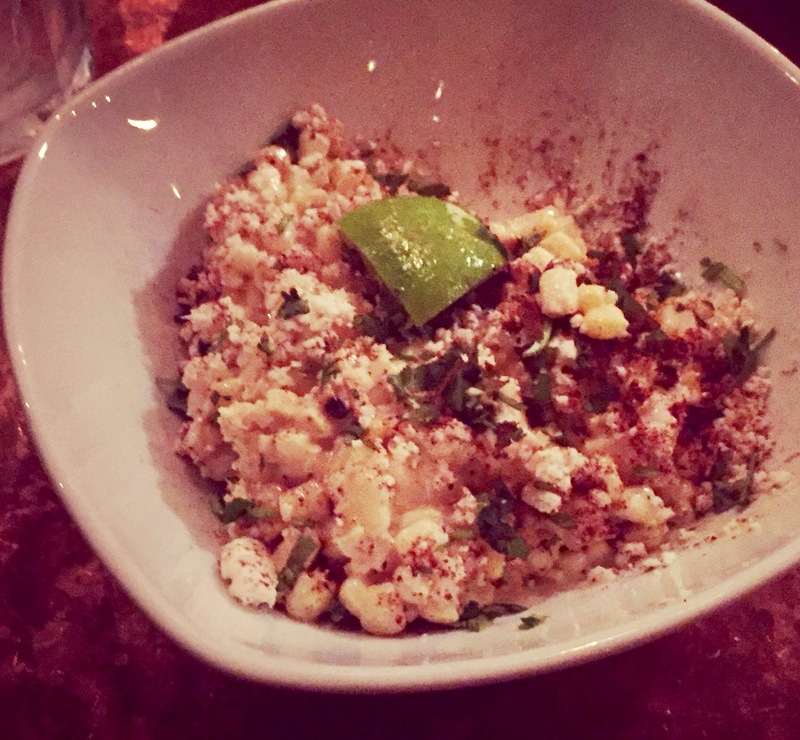 Don’t skip the namesake dish–Elote (Mexican street corn) served off the cob with crema, cotijo cheese, cayenne chile and lime. 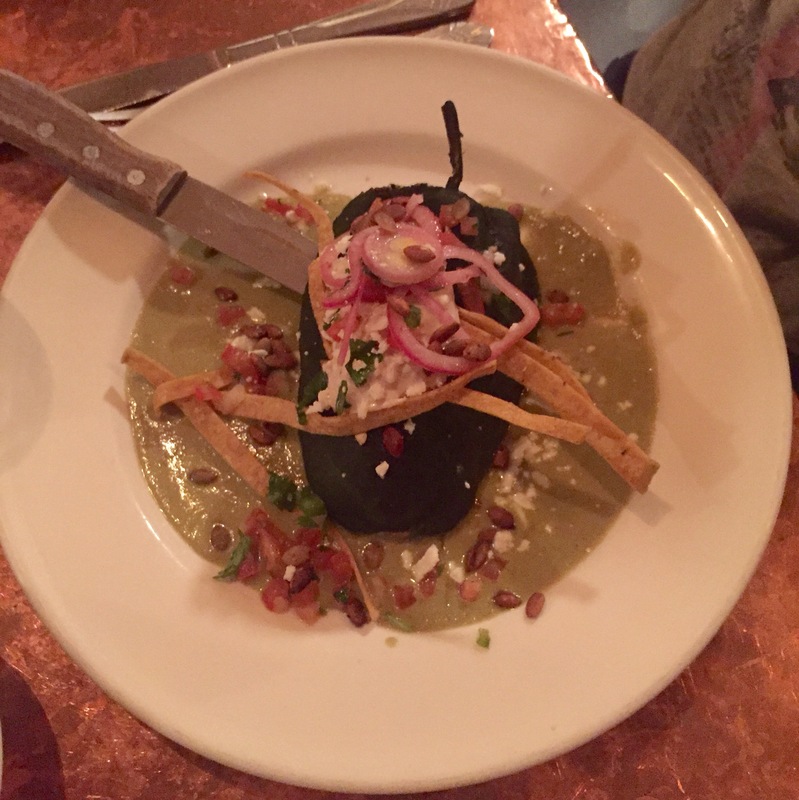 Another standout is the Chile Relleno stuffed with squash and cheese, swimming in a pool of poblano/pepita crema and topped with tortilla straws, cheese, pomegranate, and pickled onions. A huge thank you to all of you who have followed this Blog over the past 4 years. If you would be so kind, please vote for my entry in the 2016 Chopped at Home Challenge, sponsored by Sargento Cheese at foodnetwork.com. My entry for Round 1 is called Gluten Free Crazy Cauliflower Pizza…. Next Next post: Road Trip Day 5….Vegas Baby!